Summary: It's one thing to find out you're a vampire princess. It's a whole other thing to actually rule. Newly married Jessica Packwood is having a hard enough time feeling regal with her husband, Lucius, at her side. But when evidence in the murder of a powerful elder points to Lucius, sending him into solitary confinement, Jessica is suddenly on her own. Determined to clear her husband's name, Jessica launches into a full-scale investigation, but hallucinations and nightmares of betrayal keep getting in her way. Jessica knows that with no blood to drink, Lucius's time is running out. Can she figure out who the real killer is —and whom she can trust— before it's too late? My Thoughts: I liked the first book in this series enough but I never truly loved it. 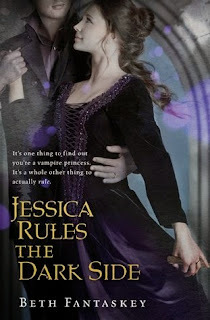 I liked Jessica Rules The Dark Side more than that one. Maybe because it didn’t deal with Jessica and Lucius in school. Now they are in charge and living in the family castle. They are rulers. I loved seeing Jessica as a princess and I loved the addition of Mindy coming to visit. I even liked Mindy’s love interest. It fit perfectly. When one of the elders is murdered it puts Jessica and Lucius in a very sticky situation and they have to figure out who did it. If you haven’t read the first one, I don’t really want to give much away in this review so I’m going to keep it short. I enjoyed this one more than the first and I’m glad. It took me a little while to get through the first and it felt really long and drawn out. I kind of just flew through this one. Overall: I liked this one. It had more mystery and I liked seeing Jessica grow up a bit. This one is probably more of a 3.5 cupcake rating! Cover: Like it. I am so enticed by these covers. They are cute! Chuyen cung cap cac thiet bi am thanh Loa Karaoke Hay | Loa Karaoke Hay Nhat chinh hang, giá tot.